I am a contemporary artist concerned with celebration and healing. I am deeply influenced by two key instructions for life, which are communicated to every Jewish child: “pursue justice” and “repair the world”. My work uses tradition to connect people and inspire activism. As a community builder and artist-in-residence I enjoy working in close collaboration with organizations, community members, students, and other artists. Most of the materials I use are locally resourced and renewable or re-purposed. Asherah has been awarded a 2019 Alumni Artist Residency, for the month of July, at the Maine College of Art in Portland, Maine, where she will continue her exploration of materials, like wood and fiber, and of the topics of War and Genocide in art. Dwelling Place Update: graced the lobby of the Maine State Museum. The selection of this piece recognized the role the original installation has played in Portland Jewish life over 7 years. It was redesigned and installed for one month in the Fall of 2018 as an introduction to the museum’s first ever exhibition on the history of Jews in Maine. University Of New England Gallery, Sculpture Garden Invitational, June through October 2018. Opening reception June 15 4-6pm, Portland campus, 716 Stevens Ave.
“ARRIVAL”: Works by Maine Immigrant & Refugee Artists; September to November 2017 in the Clifford Gallery, Waterfall Arts, Belfast, Maine. “Dwelling Place” solo outdoor installation September 24 through October 15 2017 at the Jewish Community Alliance (JCA) new building, 1342 Congress Street, Portland. This temporary installation is now in its 7th year. It has been shown and utilized for public interaction at museums and campuses throughout The Greater Portland area. A special event for students from all College and University campuses in the area was held in the structure, in celebration of the Jewish Tradition of Sukkot, which is about immigration, refugees, and looking for a home, while surviving the elements outdoors. Traditional music and food. “Sukkah Wood”, October 8, 2017 exhibition of 6 curated temporary installations in Inwood Hill Park, Upper Manhattan, New York. Sponsored by Chabad of Innwood and Art Kibbutz New York. Winner of $1,000 award for design and fabrication. Portland Magazine, September/October 2016, Annual Art Edition, has recognized a group of 30 Maine sculptors, including Asherah Cinnamon. p. 70. “Dwelling Place” Sixth annual solo interactive outdoor installation and Sukkah. Maine College of Art, Casco Street, Portland, Maine. October, 2016. University of New England Gallery, Annual Invitational Sculpture Garden exhibition Opening Reception Friday June 10, exhibit goes through October. 2015: Muong Studio, Vietnam Artists’ Collaboration Residency: women in Vietnam and the USA. July/August 2015 Art Kibbutz New York, Governor’s Island Schmita Artist Residency, Festival, and Exhibition. Oregon Jewish Museum Sukkah PDX 2014 Exhibition, Portland, Oregon. July/August 2014 : EMMA International Collaboration at Ness Creek, Saskatchewan, Canada. Marc Epstein, award winning author and professor of religion and culture at Vassar College, has said of this show “Cinnamon accomplishes simultaneously in her current show at the Maine Jewish Museum what some artists dream of doing for lifetimes and never accomplish.. in creating her powerful, poetic, and moving pieces, Cinnamon is able to give back to the earth-melding the intensity of nature in all its wildness and unpredictability with the nurture of an ancient tradition, some six thousand years of story-telling.. She is a storyteller through ritual, and a ritualist through the telling of stories.” For expanded review, click here. Art Kibbutz New York, International Artists Colony: THE JEWISH WALTZ WITH PLANET EARTH. Shemah: Listen. A collaborative installation based on the Hebrew letter Shin launched at Eden Village Lake in Putnam Valley, NY. HEALING ARTS & CREATING SPACES FOR EMOTIONAL RENEWAL InterProfessional Education Collaborative at University of New England, Portland, Maine. October 2011. VISUAL ARTIST IN RESIDENCE for the International Affairs Conference at Star Island, NH, July 2011. 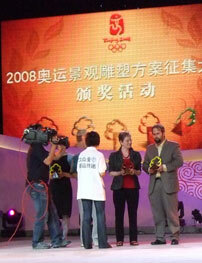 Asherah Cinnamon and Scott Fuller receive OLYMPIC FIVE RINGS AWARD, International Olympic Landscape Sculpture Competition and Exhbitions, Beijing, Summer 2008.